I wish I were in Fort Wayne, Indiana attending the Federation of Genealogical Societies (FGS) conference this week. The program looks terrific and I would love to see all my genealogy colleagues. But for those of you who, like me, are unable to attend, you can still benefit from the genealogical education by selecting presentations to purchase and listen to at home. Many of the conference sessions will be recorded by Fleetwood Onsite Conference Recording, Inc. What is new this year is that there will be digital downloads of sessions instead of CDs to purchase at <www.fleetwoodonsite.com> after the conference. I am hoping the following sessions are among those recorded as they are the ones I would most like to hear this year. Everyone will have different sessions that they feel they need, as we are all at varying places in our genealogical education. We may need lectures on records, methodology, or specific locations or ethnicities. What sessions are you most interested in? I would love to have you leave a comment and let me know what you would like to download this year. 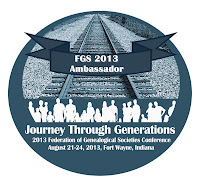 The FGS conference program can be found here.